Complete Racer-X IPSC and USPSA Holster for the competition shooter. Introducing the Racer-X holster, which brings the improved performance of the Alpha-X hanger assembly to the Racer holster, while maintaining its attractive, affordable price point. 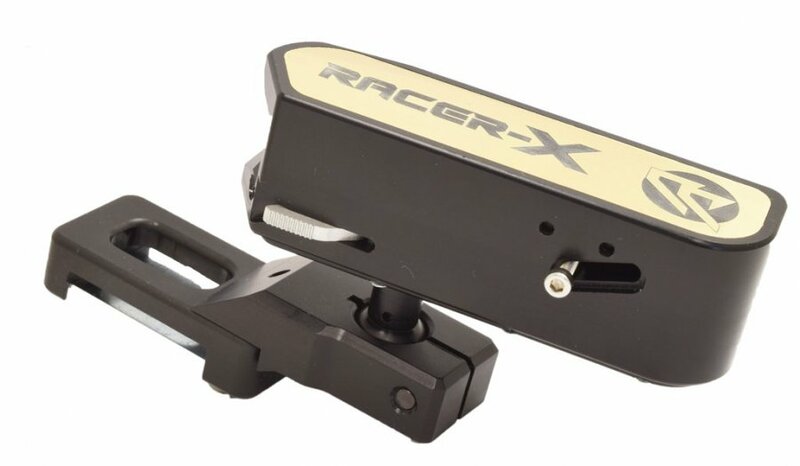 The all-new Racer-X hanger utilizes the same type of ball joint and rail system from the Alpha-X, attaching directly to the side of the holster body, eliminating the long vertical rod and the use of grub-screws to lock the ball joint. This improves the holster’s stability, rigidity and ability to make minute adjustments. The lower part of the belt hanger is so similar in design to the Alpha-X, that the optional thigh pad from the Alpha-X can be used on the Racer-X as well. The Racer-X Holster uses the same patented quick release and secure retention system that the Race Master and Alpha-X lines utilize, but without the aluminum body and interchangeable blocks. 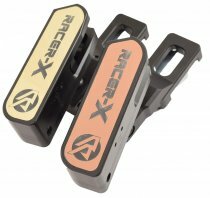 In the Racer-X Holster, the insert block itself is the body. This saves dramatically on production costs while not compromising on performance. You do, however, lose the ability to swap out insert blocks for various gun types. The Racer-X’s aluminum hanger is slimmed down but still offers the same wide range of adjustments and secure firm lock up of the Alpha-X Holster. The new Racer-X hanger assembly represents a massive improvement on the older Racer hanger design. The new hanger, mimics the extremely successful Alpha-X holster design, improving the ball-joint lock up and adjustability, the vertical adjustment as well as allowing for the holster to detach. While a thigh pad is not included as standard, the Racer-X holster is designed to work with the same optional thigh Pad offered with the Alpha-X. If you own an older Racer Holster, it is possible to purchase just the Racer-X hanger and upgrade your old holster with it. You will need to drill 7 small holes into the side of the holster body, to attach the new side plate. 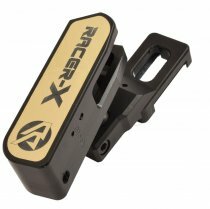 The ball joint of the Racer-X offers a wide range of motion, allowing you to position your holster at just the right angle. This holster uses a much larger ball joint and a pressure lug lock-up, which locks the ball firmly without marking or damaging it. With this system even the smallest adjustments are always possible. 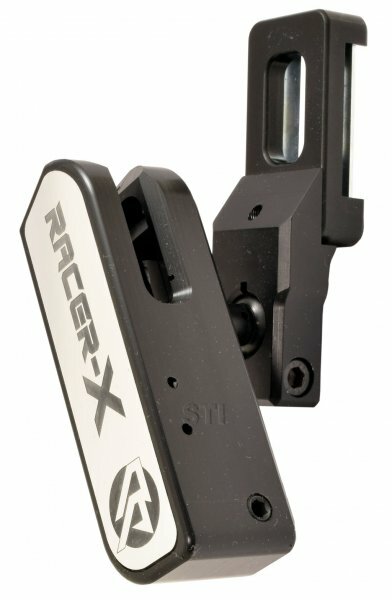 The Racer-X achieves its height adjustment by means of a rail attached directly to the side of the holster body itself. 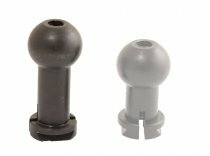 This offers an extended range of adjustment and again reduces torque and forces applied. 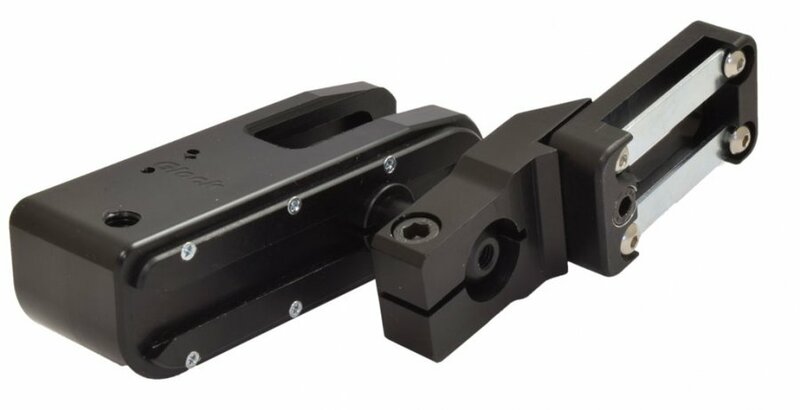 Here too the lock up is achieved by an expanding dovetail mechanism that does not gouge or damage the rail. 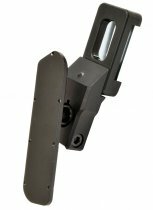 The Racer-X has a two-piece belt hanger which can be dismantled by opening a single screw, allowing all position settings to be maintained while removing the holster body from the belt for easier space-saving transport. 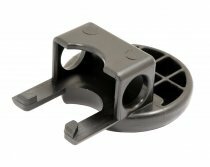 The Racer-X belt bracket is available to fit only on a 1.5” wide competition style belt. And, like all Race holsters, it should only be used on a firm, rigid, thick belt.